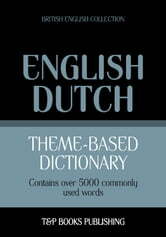 T&P BOOKS THEME-BASED DICTIONARIES are intended to help you learn, memorize, and review foreign words. 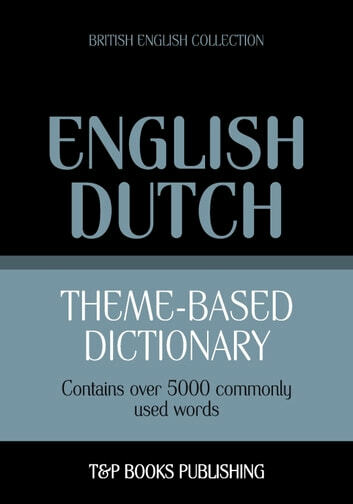 The dictionary contains over 5000 commonly used words. Recommended as additional support material to any language course. Meets the needs of beginners and advanced learners of foreign languages. Convenient for daily use, reviewing sessions and self-testing activities. Allows you to assess your current vocabulary. This book can also be used by foreigners to learn English. THIS REVISED EDITION (British English, 02.2015) contains 155 topics including: Basic Concepts, Numbers, Colors, Months, Seasons, Units of Measurement, Clothing & Accessories, Food & Nutrition, Restaurant, Family Members, Relatives, Character, Feelings, Emotions, Diseases, City, Town, Sightseeing, Shopping, Money, House, Home, Office, Working in the Office, Import & Export, Marketing, Job Search, Sports, Education, Computer, Internet, Tools, Nature, Countries, Nationalities and more … SPECIAL FEATURES of T&P Books bilingual vocabularies: Words are arranged according to their meaning, not alphabetically. Content is presented in three columns to facilitate the reviewing and self-testing processes. Each theme is composed of small blocks of similar lexical units. The vocabulary offers a convenient and simple transcription for each foreign word. IF YOU HAVE any question, suggestion or feedback, please contact us: admin@tpbooks.com.